Apple recently released its new line of iMacs: a new 21.5-inch and a 27-inch one, both armed with Retina displays. It’s interesting to see the components of the new iMacs, considering that it’s the latest and the most advanced of its kind. The 21.5-inch is Apple’s entry level desktop hardware, while the 27-inch one is for users looking for something a bit bigger and more luxurious. The 4k high-resolution display was manufactured by none other than Apple’s long-time partner, LG Display who happen to be the same makers of the 27-inch 5k model. The worst thing about this entry-level model is the non-upgradable RAM. Buyers looking to upgrade its satisfactory, but limiting 8 GB (gigabyte) of RAM will be stuck with it. Ironically, iFixit found out that it’s manufactured by Apple’s rival in the smartphone market, Samsung. The RAM cards were soldered into the logic board, making removal – and upgrading – hopelessly impossible. Most of the innards looked the same when compared to its predecessor, however, there are a few differences. These include the WiFi antennas being locked into the AirPort card with secure cable clamps and the hybrid Fusion Drive being made with a smaller flash partition. Along with the RAM, the CPU is also soldered into the logic board, while the glass panel with the infused with the retina display LCD. 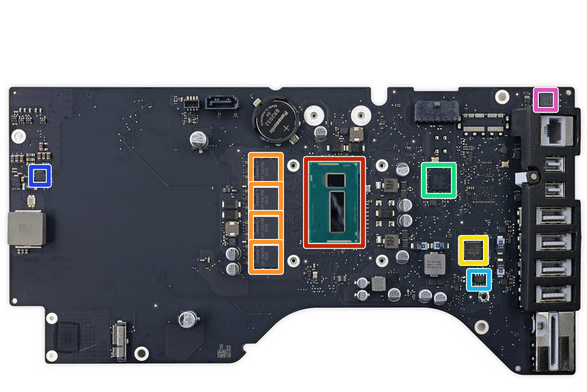 iFixit gave the 21.5-inch Mac a repairability score of 1/10, mainly because of the soldered and fused parts. Basically, you won’t be able to upgrade or replace some of the broken parts, like the RAM and CPU simply because they’re stuck on the logic board. The glass panel and the LCD can be replaced, but due to them being fused together, you’re better off buying a new Mac instead. Overall, if you are buying the smaller of the two new iMacs, be sure you’re going to take good care of it. If the other half of the two new iMacs is a disappointment, fortunately, the other half can’t be considered that way. If purchased straight off the market, the built-in RAM has four module slots supporting 4 GB RAM each. This can be upgradeable – in complete contrast with the 21.5-inch model. It can support RAM cards for up to 16 GB, giving you an insane amount of RAM. This in turn puts the new iMac on a whole new level, allowing you to support and run a ton of programs simultaneously. Unfortunately, the RAM upgrades have to happen before you purchase it. You need to decide which amount of RAM you want installed given that the modules are soldered, just like the 21.5-inch one. Though you can’t upgrade it yourself, you can still have a truckload of RAM ready at your disposal. There are several variants of this iMac offering differently-powered processors. These include a 3.2 GHz quad-core Intel Core i5, a 3.2 GHz Intel Core i5 which is configurable up to 4.0 GHz, and a 3.3 GHz configurable up to 4.0 GHz quad-core Intel Core i7. The new iMac will come equipped with Apple’s new line of accessories, namely the Magic Keyboard 2, Magic Trackpad 2, and the Magic Mouse 2. These new accessories are connected via a Lightning connector and can have up to nine hours of power after just a two minute charge. The graphics processors are no joke as well, with the strongest variant armed with an AMD Radeon R9 M395 graphics processor. It can be configured to a higher model as well. We can safely say that the new iMacs are fitting successors to the ones which were released previously. Though the 21.5-inch version’s RAM cannot be upgraded, it still sports a new 4k Retina display, while the new 27-inch version has a beautiful, 5k Retina display – just be aware for the 21.5-inch version’s limitations before you buy it.